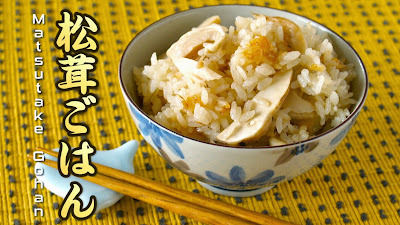 Matsutake Gohan is a very simple rice dish to enjoy the flavor of Matsutake mushrooms! 1. Wash rice and leave for about 30 minutes. If you are using pre-washed rice (musenmai) you don't have to wash it. 2. Clean each Kombu with moistened towel. Soak in 400ml water for 30 minutes. 3. Clean each Matsutake mushrooms with moistened towel if necessary, shave the hard part of the stems if necessary, slice and season with A. 4. Place the rice and C in a pot, add Kombu Dashi (2) to the appropriate level indicated in the pot. Then place the seasoned Matsutake (3) on top of the rice. 5. Place the pot into the rice cooker. Cover and press the button to start. 6. When it's done, toss the rice lightly using a rice paddle, then serve. You can garnish with chopped Mitsuba (Japanese wild parsley) if you like.